GPIO Zero supports a number of different pin implementations (low-level pin libraries which deal with the GPIO pins directly). By default, the RPi.GPIO library is used (assuming it is installed on your system), but you can optionally specify one to use. For more information, see the API - Pins documentation page. One of the pin libraries supported, pigpio, provides the ability to control GPIO pins remotely over the network, which means you can use GPIO Zero to control devices connected to a Raspberry Pi on the network. You can do this from another Raspberry Pi, or even from a PC. See the Remote GPIO Recipes page for examples on how remote pins can be used. Alternatively, pigpio is available from abyz.me.uk. You’ll need to enable remote connections, and launch the pigpio daemon on the Raspberry Pi. Alternatively, enter sudo raspi-config on the command line, and enable Remote GPIO. This is functionally equivalent to the desktop method. This will allow remote connections (until disabled) when the pigpio daemon is launched using systemctl (see below). It will also launch the pigpio daemon for the current session. Therefore, nothing further is required for the current session, but after a reboot, a systemctl command will be required. 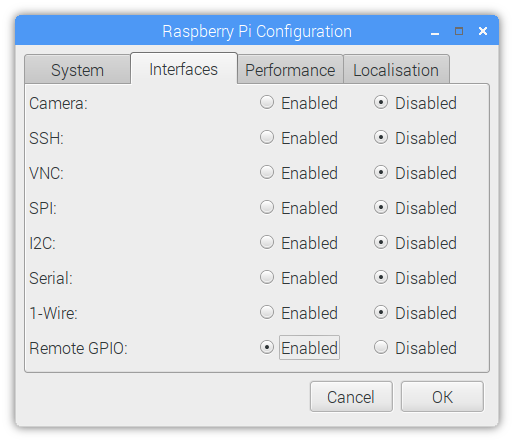 Note that running sudo pigpiod will not honour the Remote GPIO configuration setting (i.e. without the -n flag it will allow remote connections even if the remote setting is disabled), but sudo systemctl enable pigpiod or sudo systemctl start pigpiod will not allow remote connections unless configured accordingly. If the control computer (the computer you’re running your Python code from) is a Raspberry Pi running Raspbian (or a PC running Raspberry Pi Desktop x86), then you have everything you need. If you’re using another Linux distribution, Mac OS or Windows then you’ll need to install the pigpio Python library on the PC. First, install pip. If you installed Python 3 using brew, you will already have pip. If not, install pip with get-pip. This usage will set the pin factory to PiGPIOFactory with a default host of 192.168.1.3. The pin factory can be changed inline in the code, as seen in the following sections. will flash the LED connected to pin 17 of the Raspberry Pi with the IP address 192.168.1.4, without any code changes, as long as the Raspberry Pi has the pigpio daemon running. When running code directly on a Raspberry Pi, any pin factory can be used (assuming the relevant library is installed), but when a device is used remotely, only PiGPIOFactory can be used, as pigpio is the only pin library which supports remote GPIO.